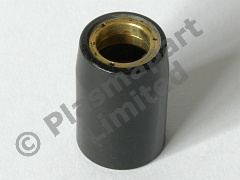 Consumables suitable for use with the SG51 or AG51 which is used on many Chinese plasma cutters. These parts are excellent quality and are manufactured to extremely fine tolerances - the shrouds are manufactured from a heat resistant polymer and turned brass. This pack is supplied as shown, and contains 1 Shroud. For machine compatibility & further details click the products web page link below the discount table.